Among the most impactful instruments in Barry Trotz's coaching toolbox is playing time, which he has been unafraid to wield throughout the season. Recently, the Washington Capitals coach has taken away ice time from forward Tom Wilson, who has found himself benched in each of the past two games. 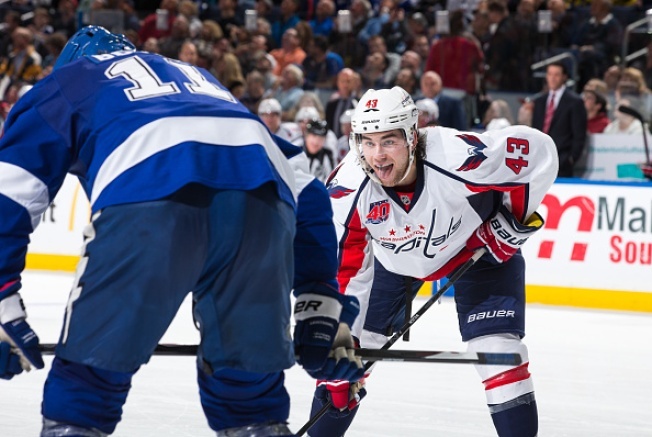 During the Capitals' 2-1 victory Monday against the Ottawa Senators, Wilson returned to the bench with 7:59 remaining in the second period, remaining there until 9:37 had elapsed in the third when he temporarily rejoined the fourth line. Against the New Jersey Devils on Saturday, he transitioned from first-line right wing to spectator for the final 11:55 of the second period. The 20-year-old has taken 14 shifts in each of his past two games. Only three times this season has he taken fewer: his first two games following a return from offseason ankle surgery and a Nov. 8 game against the Carolina Hurricanes that was shortened by injury. Pressed for an explanation in Newark, Trotz's reasoning was "real simple," telling reporters that he did not think WIlson "had a lot of jump." Asked again Monday, he was succinct. "Too many pucks are dying with Tom right now," Trotz said. "He's got to get his feet moving and too many turnovers for me." As Trotz tinkered with his depth chart after being hired in May, he pictured Wilson's ruggedness and skill, the latter suppressed by fourth-line duty last season, meshing with the transcendent talent possessed by Alex Ovechkin and Nicklas Backstrom. Puck-possession statistics suggest that they have been successful in dictating the pace when on the ice, but as Trotz alluded to, Wilson lately has struggled to facilitate. In Wilson's place, Trotz has trusted Jay Beagle, who scored his career-high fifth goal Monday, as a capable understudy. As Wilson continues to learn how to handle the responsibility that his assignment entails, Trotz will not hesitate to motivate him in such a way. "Like I say, I keep putting Beags up there and soon as I put him up there, on that first shift he seems to score," Trotz said. "Tom is going to probably miss some shifts here and there because it seems to work."